He was a well-recognized community leader noted for building more than 1,000 structures throughout Southern California and for playing a mean game of golf at Annandale Country Club. 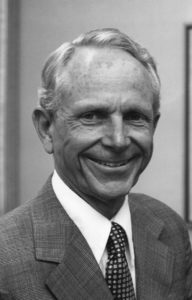 What many did not know about Orrin K. (OK) Earl was how deeply he was committed to Pasadena which he considered one of the best places in the world to live. To help keep it that way, even after his death, he left an unrestricted bequest to the endowment of the Pasadena Community Foundation where he had served as a Board member for almost 12 years and as its Chair for one term. During his tenure at the Foundation, he helped determine how the Foundation’s unrestricted grant money was spent to support non-profits in the community. He also gave generously of his personal resources with donor advised gifts through the Foundation. Describing himself as a builder, not a contractor, OK Earl was always concerned about the future of the community where he had graduated from High School and raised this family. Upon his death in January of 2004, OK Earl became a member of the Pasadena Community Foundation’s Legacy Society by including PCF in his estate plan. This bequest created the O.K. Earl Endowment.